story by ariela roseThe Children’s Hospital of Philadelphia (CHOP) is no stranger to innovation. Consider it’s new EcoCHOP initiative, which aims to implement responsible practices—from recycling, building and purchasing, to more healthcare-specific areas—that ultimately care for the health of the environment. One way that EcoCHOP hopes to reduce healthcare waste is through educating employees on the proper disposal of “red-bag”—or biohazard—waste. This is done via “red-bag audits,” hands-on training during which red-bag waste is sorted in front of employees to show which of its contents are trash, and which could actually have been recycled. According to Weaver, techniques like this have led to a 70 percent reduction in regulated medical waste, and a hospital-wide recycling rate of 49 percent. Along with statistical successes, EcoCHOP has also led to the construction of the Colket Translational Research Building (CTRB), a LEED-certified laboratory that is an impressive display of the hospital’s commitment to environmental stewardship. 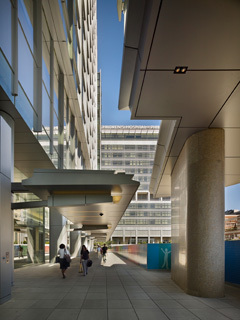 The building was designed by local architecture firm Ballinger, which worked to seamlessly integrate the building’s green elements. To maximize energy efficiency, Ballinger incorporated design strategies such as separate air-handling systems for the office areas and research lab, an important element given that medical research labs cannot re-circulate air and must utilize a system that constantly refreshes air brought into the research area. Other elements include daylight sensors, and a system for maintaining a constant interior temperature created through the use of low-emissivity materials. Each of these pieces are representative of CHOP’s commitment to reducing its impact on the environment that its patients interact with outside the hospital’s walls.